For 3 months after the date of purchase, we take care of all quality-related issues with a FREE replacement or a refund. If you have any questions, do not hesitate to contact our professional after-sale service. FUNCTION --- Easy to control, convenient to take unclean water out of the tank. PC HOSE --- Made from clear & elastic plastic. Makes it more durable and anti-kinking. 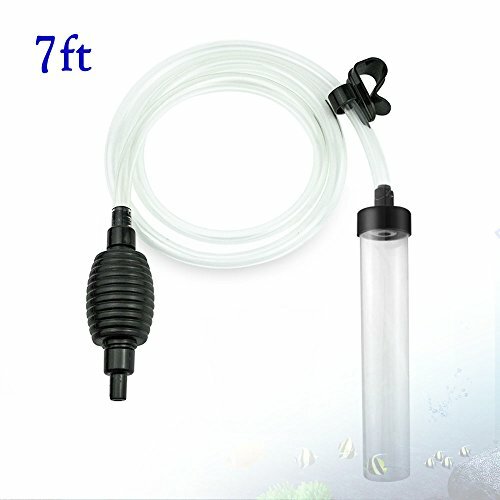 GRAVEL TUBE --- Sinkable, with a filter screen inside. Will not disturb fish or decor when it's working. SIPHON BALL --- To get water out of fish tank. All you need to do is to pinch it for 3 to 5 times. Without striking a blowing. WARRANTY --- For 3 months after the date of purchase, we take care of all quality-related issues with a FREE replacement or a refund. If you have any questions, do not hesitate to contact our professional after-sale service. If you have any questions about this product by Laifoo, contact us by completing and submitting the form below. If you are looking for a specif part number, please include it with your message.